Rich creamy, and healthy?! 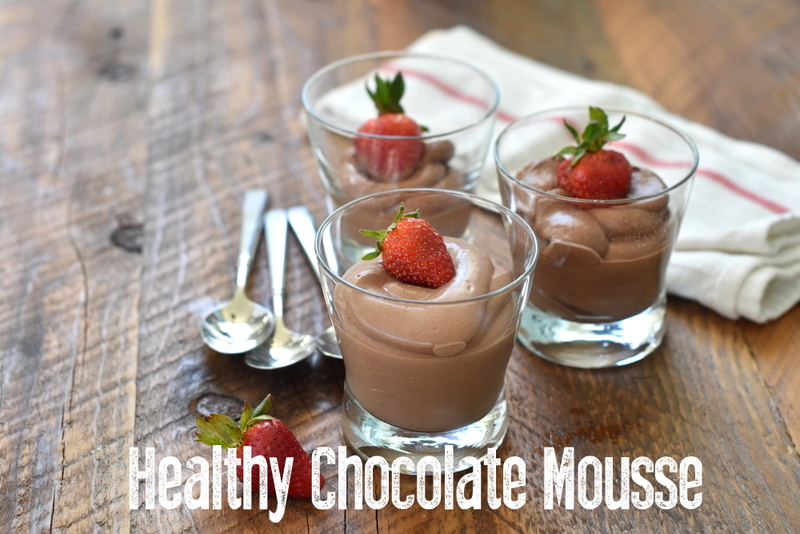 Yep…this healthy chocolate mousse is your ticket to get your chocolate fix. Do you keep cans of coconut milk in your pantry? You should! 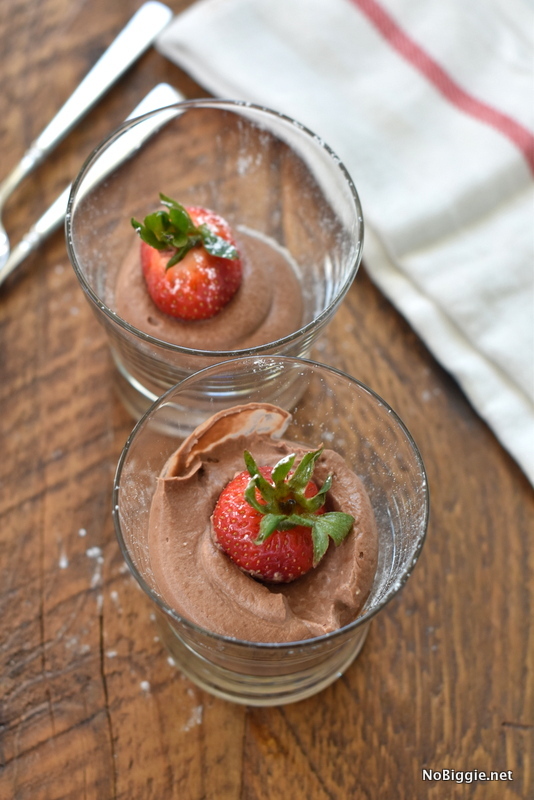 It’s a gem to have on hand especially when you’re craving rich creamy chocolate mousse. 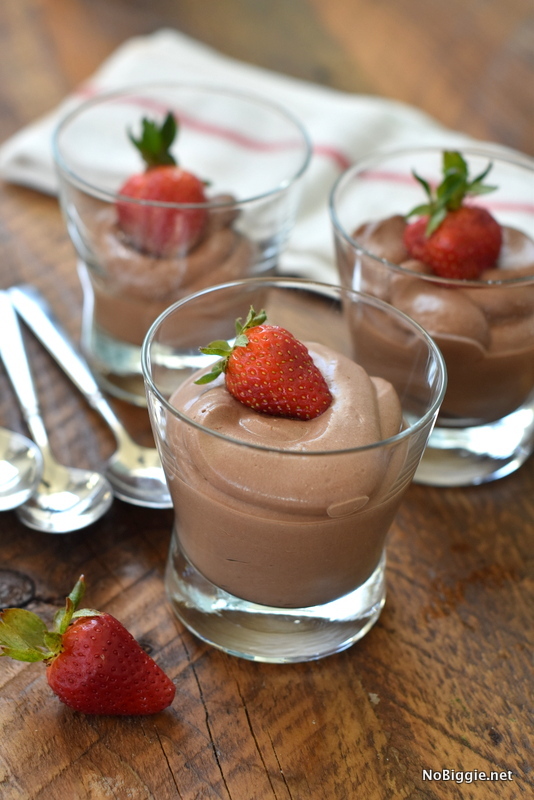 Just three ingredients is all you need to make this heavenly and healthy chocolate mousse. We made a quick video to show just how easy it is to whip up. The trick is to put a can of coconut milk in the fridge over night. The cream will rise to the top and solidify. When you take it out of the fridge, flip it over and drain out all of the watery like coconut milk…save this for later, it’s great in a smoothie. In a new bowl, dump out the coconut cream. Just add dry cocoa powder and honey…that’s it! 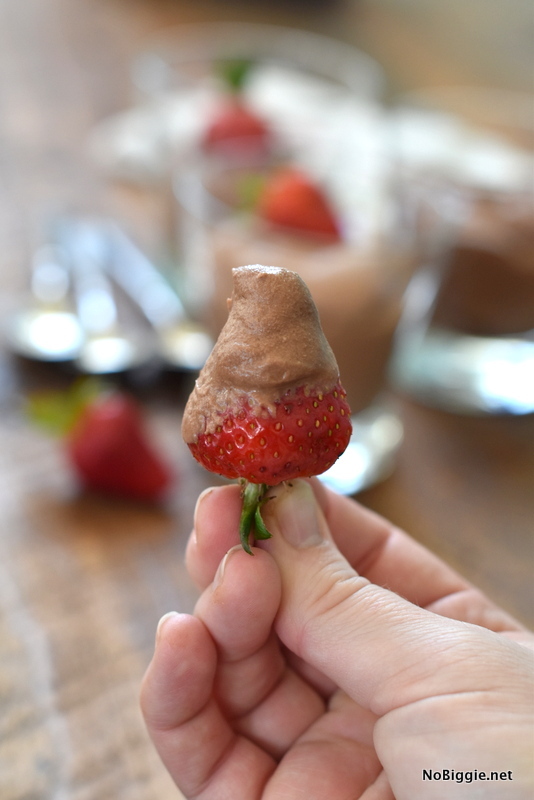 Just three ingredients for this decadent and healthy treat! You can also make just sweetened coconut cream like we did for this avocado pudding, and use it to top pies, cakes, anything you’d use real cream on. This is great for those who are off dairy. The consistency is so close to real cream, it’s so great. 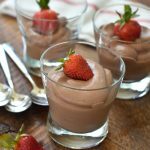 Made with three simple ingredients this Healthy Chocolate Mousse is rich, creamy and your ticket to pure chocolate heaven! Chill a can of coconut milk (not reduced fat) overnight. Open and drain off the coconut water, save this water and use it in a green smoothie. Scoop out the coconut cream into a bowl. Mix with a hand mixer until light and airy. Add dry cocoa powder and honey. Enjoy with fresh fruit like: strawberries, raspberries or bananas. I simply must try this. No raw eggs or weird ingredients. Perfect when entertaining and someone has dietary restrictions. Thank you for sharing such a delicious recipe. Yay! I’m excited for you to try it! It really is so good! Have a nice day! This looks amazing! How long can it be stored in the fridge? Does it taste like chocolate or chocolate/coconut? It tastes more like chocolate than coconut. You can definitely taste the coconut. How many servings does the above recipe make? Also, how many calories per serving? Hi Taylor! I wish I had all this info for you, but I don’t. I’m sure it can be calculated, but it varies so much in the portion sizes. Sorry! I have a question: I followed the directions exactly (or so I thought I did) and it didn’t turn out. When I took the can out of the fridge and drained the milk, I had the hardest time getting the solid cream out – it was hard as a rock! Then when I tried to whip it with a hand mixer it just turned chunky and grainy. When I added the cocoa powder and honey nothing changed and it was just a lumpy, grainy mess. I still ate it though because the taste was fantastic! Lol What might I be doing wrong? I used Trader Joe’s organic full fat coconut milk. Hi Myra! I wonder if the Coconut Cream is too cold?? Maybe it needs to come to room temp a little more to blend more smooth. Sorry it didn’t turn out, but so happy it tastes great! Hi Shanni! It makes about 4 depending on the portion sizes. Hey! We would love to feature this recipe and pictures in our next magazine. We will be sending the magazine to over 70,000 people, including our 20,000 subscribers. We will give credit appropriately.